There are several heart-warming features about the Akshaya Patra scheme that brings fresh, hot, nutritious meals to the doorstep of nearly 13 lakh schoolchildren across seven States in India. But for me, the biggest one is that it has reduced dropouts in general, and more important, arrested the tendency of parents to pull out girls from school ahead of boys. In Vrindavan in Uttar Pradesh, the massive kitchen located within the 100-acre campus housing an impressive ISKCON temple cooks meals for 1.69 lakh children, and 89,631 of these, or 53 per cent, are girls, says Suvyakta Narasimha Das, Unit President of the Akshaya Patra Foundation (APF). The 36-year-old mechanical engineer, who is also the vice-president of the Hare Krishna Movement, Vrindavan, is celibate and oversees the entire operation of this complex which uses every day about 4-5 tonnes of vegetables and 3-5 tonnes each of wheat, rice and dhal! The meal prepared here includes roti, khichdi, dhal packed with vegetables (“if we give the vegetables separately children tend to put them aside,” sighs Das) and rice. “Earlier we did try to give them sambaar but the children said dhal khatti (sour) ya kharab ho gayi hei; so now it's dhal and kadhi once a week.” he adds. Akshaya Patra started in 2000 as a small idea. In 1997, when the ISKCON temple was inaugurated in Bangalore, its members were looking for a socially relevant activity. When Mohandas Pai, who recently resigned as HR Director of Infosys Technologies, met Madhu Pandit Das, Chairman of APF and a civil engineer from IIT Bombay, they discussed the idea of feeding children in government schools. Such children often come to school without adequate nutrition and fail to imbibe much from their classes. “A wholesome midday meal would give them both nutrition and incentive to come and remain in school,” says Das. Free noon meals have been tried in India earlier, and have been a huge success in Tamil Nadu, for instance, and across the country the government was also giving 3 kg of foodgrains for a child every month. But there was no way of ensuring this wouldn't be sold during trying times. Rotis being made by a roti maker with a capacity to make 40,000 rotis in an hour at the Akshaya Patra kitchen in Vrindavan. Knowing that a few thousand meals wouldn't help, the civil engineer from IIT used his engineering skills to design a huge centralised kitchen to cook meals for 30,000 children. As equipment designers and manufacturers' experience was limited to hotel kitchens that could cook a few hundred meals at a time, the APF team had to design both the structure of the kitchen and cooking equipment. This capacity had to be expanded soon to 1 lakh meals; next came a request from Jaipur and the APF set up a kitchen there for feeding 1.5 lakh children. For Krishna devotees, Vrindavan was a natural choice and the scheme was introduced here. But the South Indian meal of rice, sambaar, curd and vegetables did not work here. While only 5,000 children were being fed here in 2005, when Das came to the Vrindavan facility, rotis were made manually. But in Mathura district alone 2 lakh children needed a hot midday meal “and if we wanted to scale up to meet that number, we would need 6 lakh rotis every day, which was manually impossible,” he says. So the hunt began for a suitable roti machine. At the Kanyapur Madhmik Vidyalaya, Asha Sharma, the principal, leads me to Class VIII, where about 25 bright-eyed girls are eager to give me their feedback on the Akshaya Patra food. Khichdi is clearly their favourite, followed by roti, dhal and rice. But they are sure of one thing; they don't like the kheer! Now this will be a challenge for Das; in the APF kitchens in the south, sweet pongal is the weekly dessert, but in UP the children didn't have much of a liking for this meethi khichdi! Another teacher agrees with Das's assessment that for many of the children this would be the only square, wholesome meal they have during the day — each meal is around 500 calories, more than the 350-400 calories recommended by nutritionists. The annual budget of APF is Rs 100 crore. It has 18 kitchens in seven States, Karnataka, Gujarat, Assam, Orissa, UP, Rajasthan and Chattisgarh, and eight have ISO 22000 with HACCP (food safety) certification. While about half of what they need comes through the foodgrains provided by the government, donations, both large ones from corporates and small ones from individuals, make up the other half. It is possible to donate through their Web site. Two of the biggest donations have come for the kitchens; around Rs 7 crore from Sudha Murthy — both from the Infosys Foundation and her personal funds — to build the Hubli kitchen, where she also supports the meals cooked. The Jindal group donated Rs 8 crore for the Bellary kitchen in Karnataka a few years ago. Then there are individual donors, such as Pai, who is on the APF board and “never misses a meeting”. Donations from devotees visiting ISKCON temples help too. But a continuous supply of funds is a huge challenge, particularly for the smooth operation of the kitchens. With the government being a major partner, delays in sanctions or supply can derail the programme. “Six months ago we had to take a Rs 50-lakh bank loan to keep the programme running. How many charities would do that,” asks Das. More requests are pouring in; “we now have invitations from CMs… Maharashtra and Punjab and we are exploring Madhya Pradesh too,” adds Das. And when these States get Akshaya Patra kitchens, more Aartis, Sonams, Bhawanis, Ashoks, who come to school with barely a cup of tea and a toast – often not even that – will get, along with wholesome food and education, a future sans mere lip service for rural India. When Akshaya Patra’s Vrindavan kitchen was looking for a giant roti machine, those available could make only 500 rotis per hour. So the biscuit makers of unjab were approached, given design and Rs 20 lakh — no manufacturer wanted to invest in a machine that might not work — to fabricate a machine that could take 10,000 rotis an hour. The machine was installed but served the purpose only for a while. Giving me a tour of the totally automated, mammoth kitchen where the mere scale of the operations takes your breath away, Suvyakta Narasimha Das points to that machine which today is a relic but with great sentimental value. It served the purpose as long as this kitchen was serving only 60,000 children, but became irrelevant when more children were taken into the programme. Now a machine that would roll out 40,000 rotis an hour was needed; tortilla manufacturers in the US and Holland were consulted and the kitchen got its present roti maker. Watching that operation in the wee hours of the morning — the kitchen springs to life at 9 p.m. and by 6 a.m. the cooking is completed — is nothing less than a major treat. The aata is made in the in-house chakki — “we are dealing with children and can’t afford any adulteration, so we make our own aata and masala powders” — and it’s awesome to watch the rotis being churned out by the machine. A giant lump of aata fed at the top is spread by the rollers into a thin, flat, fabriclike sheet, from which round-shaped rotis are cut and passed through the oven with LPG burners. After one side is cooked, the rotis are automatically flipped to cook the other side, then fall onto a jaali-like surface where they puff up, as in millions of Indian homes. 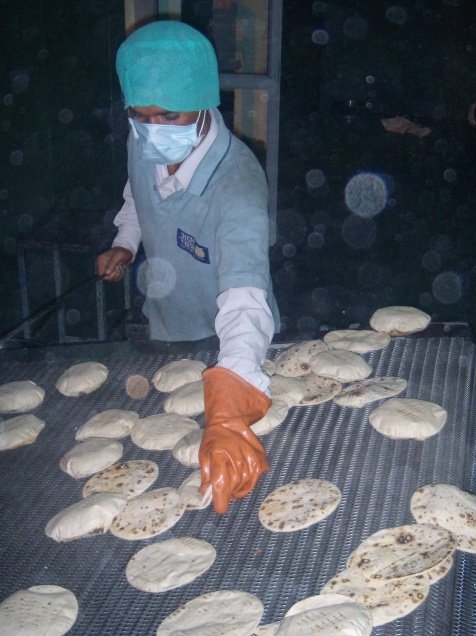 Next, oil is sprayed on the rotis to prevent their sticking together; a pair of gloved hands touch them only during packing. The wasted dough goes back to the machine to make more rotis. Not only is the roti-making process automated, mechanised cutters chop vegetables. The containers, as can be imagined, are huge; there is a 150-tonne silo to store rice and another 100-tonne silo for wheat storage. The rice and wheat come from the FCI as the government is a partner in this programme. A grader separates the paddy and other foreign material from the FCI rice — the daily ration is 100 gm of grain for every child — and then further separates the full grain from broken rice; the latter is used for khichdi, and the entire consignment is passed through a de-stoner. The kitchen is carefully designed so that the preparing, cooking and packing sections are at different levels and the force of gravity is used to transfer the cooked food into the containers. Pointing to a huge cooking vessel, Das says, “This uses steam and can cook rice for 1,400 children in about 20 minutes.” To deal with the frequent power cuts there is back-up through 300 and 200 KVA DG sets.